Training in Taekwon-Do is based around both mental and physical aspects of the human condition. All students are expected to learn and know the Tenets of Taekwon-Do and the Student Oath as created and outlined by our Founder, General Choi Hong Hi. You will encounter the application of this first tenet from your earliest class. The first thing that every student is taught is how to bow. The importance of bowing respectfully to your instructors and fellow students cannot be stressed enough. This conveys a sense of mutual respect and also recognition of seniority. You should show respect to your Dojang by bowing when you enter and exit the training area. Should you ever need to be excused from a class you show courtesy by asking your instructor for permission. This is not only good manners, but from a safety point of view, your instructor needs to know where all the students are. At the heart of integrity is you just being an honest person in your dealings with others but also in your relationship with yourself. It means that when you start a task you can be relied upon to do what is required. You will have the stamina to see the task through to the end, regardless of its outcome. You should know the difference between what is right and what is wrong. You should have the courage to admit your mistakes and not let others take the blame when it is you who is at fault. Giving up is easy. Whether the challenge is learning a new technique, going to your first tournament or practising what you find difficult, your first thoughts may be to give in and not try. If you meet your challenges head on and persevere until they are overcome your feelings of success will be all the greater, knowing how much effort has gone into reaching your goals. It is only through strength of mind and persistence that you will achieve anything in Taekwon-Do. It is most important to display self-control because you are acquiring skills that can turn your hands and feet into lethal weapons. You should have the moral and mental control to know that there is a correct time and place to implement the techniques that you have learnt. This ensures that there are no accidents or injuries during training. During competition, your emotions should be kept in check. You must not let anger or aggression cloud your judgement. This loss of self-control can be disastrous for you and your opponent. 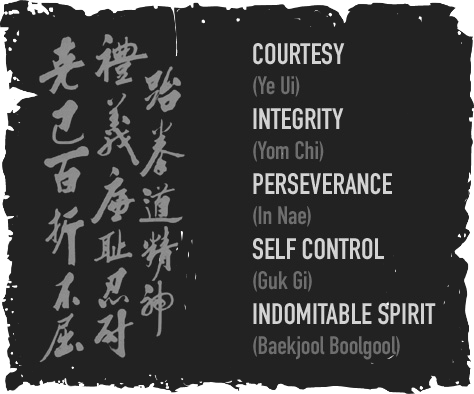 Learning strong self-control in Taekwon-Do is a gift that can be utilised in all aspects of your life – family, work, business, other sports. This is often interpreted as having a fighting spirit. Standing up for what you believe in, mental toughness to not back down when you know something is right. Confronting your problems head-on and with a strong spirit. Without indomitable spirit, your Taekwon-Do exists purely on a physical plane. i.e. Your brain is telling your leg to move a certain way to make a certain kick, but without the spirit behind it, the kick is incomplete! The 4th line, “I shall be a champion of freedom and justice” can apply to many areas of life and although many may think one would have to do something amazing to achieve this, this part of the oath can be respected by even the littlest things in one’s daily activity. If one becomes more open-minded to understanding others ideologies or the way others go about their lives instead of being quick to judge, then maybe the world would be a more understanding and accepting place. Thus allowing people to have the freedom they deserve. By accepting this belief one is bringing justice to this world and therefore being a champion of justice. As we often see, conflicts can occur over common misconceptions of information. One must understand the full story and have all the facts before he can truly make a proper judgement. The final line of the oath is “I shall build a more peaceful world”. One can also easily obtain this goal by going about their daily lives in a more peaceful manner. If everyone did this, the world would obviously become a more peaceful place. As we often see, conflicts can occur over common misconceptions of information. One must understand the full story and have all the facts before he can truly make a proper judgement. However, this does not mean a student cannot defend themselves against aggression directed towards themselves as that would defeat some of the purpose of Taekwondo, an art of unarmed self-defence. That does not mean though however a student can provoke aggression towards another individual, as that would be breaking the oath. As we often see, conflicts can occur over common misconceptions of information. One must understand the full story and have all the facts before he can truly make a proper judgement.